Was Malaysia Airlines Flight 124 anywhere near Exmouth ? @TBill. The differences in fuel consumption between engines depends on what flight profile is assumed. Also, one IDG carrying the load would have a ‘double’ effect on fuel consumption difference, increasing that engine’s and reducing the other’s. The APU providing that power for a long period would reduce left tank fuel and it’s open air inlet would increase drag; though that scenario would require a rewrite of the final BFOs’ cause. Then a pilot could alter all that, depending on his objectives. Wow, quite the dressing down. Jeff, you have presented a fairly intricate theory regarding the plane’s disappearance to Kazakhstan. It’s been a while now. Have you done anything to further corroborate your theory? Has there been a reaction of any kind from the accused parties? Considering that the plane hasn’t turned up along the southern arc despite many millions spent and the apparent relative ease of spoofing data whilst flying the northern arc, as well as the general impression of Russia, the theory doesn’t seem too implausible in the scheme of things. So, any new developments? @Havelock, Thanks for your question. While I can’t address any of your points specifically, I can say that I am continuing to follow leads and expect to publish updates. @ Boris, I appreciate your desire to see parallels between Air India 101, Malaysian Air 124 and MH370, but they don’t really hold up, do they? In fact, outside of the three flights having similar airframes, there is little to connect them. To begin with, there is no reason to believe that MH370 had an ADIRU problem and certainly not one like MH124, which was immediately diagnosed and solved with an airworthiness directive to upgrade the software. And when the investigation is complete, AI101 will likely have had a very different problem itself. 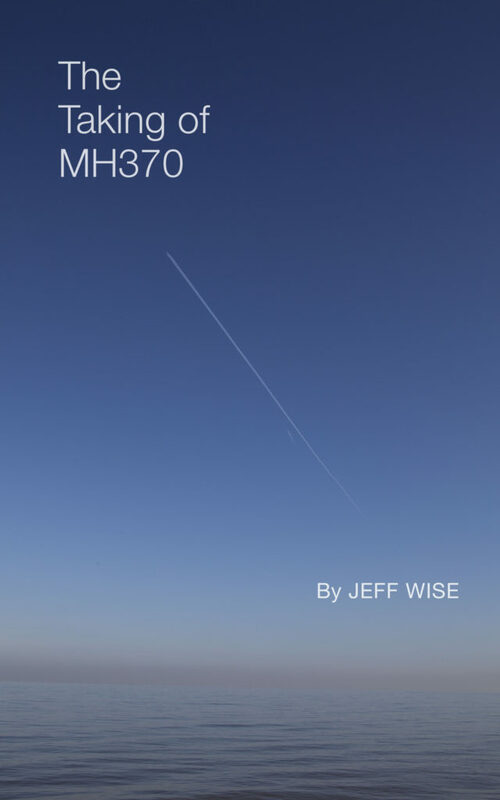 Further, unlike MH370, AI101 and MH124 maintained communications—and, of course, despite their problems, landed in a directed, controlled and witnessed manner. It might help to keep in mind that there have been well more than 4 million 777 flights since the plane’s introduction. Pointing to two (at this time unrelated but likely) software failures across that many cycles as some sort of investigative pattern is just grasping at straws. Likewise, noting that these two airlines were Flag Carriers—most international airlines are. As for the AI101 connection to 9/11—this is pure woo. There is as much of a thread between AI101 and National Airlines 101, a piston-powered four engine aircraft from 66 years ago, as there is in the fact that a previous Air India 101—then a Bombay to London route—crashed into Mont Blanc, or that including NA101, there were a total of three crashes of flights that departed Newark Airport in three months. Can someone else comment ? Thank you! I wish you all the best. Thank you. Trying to understand that case…that event occurs 15-minutes after INOP. Are you saying that is the recorded BFO event? If so, that is coming too long after APU on time. No, I’m not saying that it is the BFO event. I’m saying that the ATSB misrepresents the simulations in suggesting that the recorded BFO’s indicate that MH370 must have crashed close to the 7th arc. Firstly the rate of descent in the simulations occurred many minutes after the 7th arc would have been generated, and secondly, even if those rates of descent had occurred at the time of the 7th arc, the aircraft could easily have been recovered less than a minute later. In terms of total energy the airplane looses about 1800 feet per minute with both engines inoperative in the Case 05 simulation. Within your graph’s seconds range, 1866 – 1874 for the Min. 1871 – 1879 are of the required interval and ROD difference for the Max but that is not reached (9,500 to 20,000 fpm). Another minute later than yours and the max not met. My table spaces layout did not survive. @David: I agree, and I’m not disputing the fact that Case 5 meets the ATSB’s and Holland’s BFO criteria, except for the timing relative to the 7th arc. The point of my comment is that the airplane pulls out of a 15,000 fpm dive all by itself. @Gysbreght. You quoted the ATSB’s assessment of the simulations and included their 8 secs and 0.7 ‘g’ criteria. So your 15,000 fpm, that being after 8 secs, I took to be your opinion as to the descent rate the ATSB had in mind as a measure of simulator consistency with the BFOs, though of course that did not meet the 0.7 g descent acceleration. My intention was to complement your thesis. I was reluctant to point out that the ATSB’s descent measure was in fact 3,800 – 14,600 fpm minimum, 8 secs apart, to 14,200 to 25,000 fpm maximum, also 8 seconds apart, average descent acceleration about that 0.7 ‘g’ in both cases. Instead I added simply that the latest Holland figures were only realisable at the end of the descent, though the new maximum descent rate of 25,300 fpm was not realisable at all, an 8 sec descent reaching a maximum of about 20,300 fpm. The recovery from a 15,000 fpm dive I found (and find) unremarkable that being in the nature of a phugoid. The ‘level flight’ was merely temporary. More important (to me) is that the high descent rate timing is so late that it cannot be seen as consistent with that of the BFOs anyway. A pilot would be needed for that. @David: Thanks for your explanation. My interpretation was that anything between ‘min’ and ‘max’ meets the criteria, 4,000 and 14,500 fpm being the most likely values. “The recovery from a 15,000 fpm dive I found (and find) unremarkable that being in the nature of a phugoid. – that the dive and recovery manoeuvre doesn’t cost anything in terms of potential gliding range. In Case 5 the airplane goes through about a dozen of phugoid cycles of increasing amplitude. Each of those cycles involves a dive and recovery, and yet the average rate of descent and the resulting distance covered by the airplane are no different from that in a steady descent. The reason for that is that the lift-to-drag ratio does not change significantly, therefore the rate of energy dissipation does not differ significantly from that in a steady glide. Where are you getting at ? @Peter Norton: Please ignore the last sentence. Somehow I misread or misinterpreted the time difference between the incomplete ADS-B messages and the second “maintaining FL370” report. Apologies for any confusion caused by that mistake. The fact that Flightradar 24 did not receive complete ADS-B messages between 17:17:04 and 17:19:17 means that the difficulties with automatic flight data reporting began before the Mode S symbol of MH370 dropped off from radar display at 1720:36 UTC. Yes. But you don’t see a connection to the repeated flight level radio call anymore? Maybe you originally thought that the “maintaining FL350” came AFTER the onset of the communication problems. This would of course be suspicious. Yes, I don’t see a connection to the repeated flight level radio call anymore. In this Case the aircraft does not recover by itself as you can see. It continues with the increasing phugoids until hitting the sea well short of gliding range. He has to stop or at least dampen those phugoids: in abnormal cases, more. I add that if he doesn’t, or straighten the aircraft, effectively he is inactive. @David: Please use your imagination. Of course the person at the controls is not inactive. He needs to initiate the steep descent that produces the two values of BFO at the time of the 7th arc. And when he is back to about level pitch attitude and about 200 kts CAS he only needs to stabilize the pitch attitude and to maintain approximately wings level. The impact of that single dive and recovery manoeuvre on the available gliding range is obviously less than the succession of phugoids in the Case 5 simulation. @Gysbreght. I agree that a pilot will need to initiate a BFO-consistent descent for that to be, “at the time of the 7th arc”. That will be about 2 mins after left main bus power loss if APU auto-start is what prompts the BFOs. Switchery could advance or delay that though if someone had the mind. Please overlook the gobbledegook of the escapee last couple of lines. @David: I’m glad that we finally found something we can agree on. Why would Captain ZS fly 5 hours southward, wait for the first engine to flame out due to fuel exhaustion, then 15 minutes for the remaining engine, then another minute or so, and then suddenly decide to to push the control column forward and to keep it there, all the way until he crashes into the waves? @Gysbreght. Events. He (or another) was suicidal at the end, though that might or might not have been his intention at take off. That is highly speculative of course but to me the best fit, as yet anyway. Incidentally the sequence you describe may not have been the actual. Just an example, in normal configuration: the left bus tie selected to ‘isolation’ would prevent the APU re-powering the SDU on auto-start that is until the bus tie was selected to ‘auto’. Then again it might have been manually started, or if auto-started not for long. Or again he might have cycled the left main bus (and hence SDU) via the left IDG or a bus tie while he had fuel still. Don’t know why he would. At 17:05:44; 17:06:44 and 17:08:46 the roc is -128 fpm (roc=0 at 17:07:38). and reported maintaining FL350 again at 1707:56 UTC [0107:56 MYT]. I wonder if perhaps near the time of the second “maintaining FL350” one of the pilots left his seat and inadvertently moved the control column, which would have disconnected the autopilot. Another point perhaps worth noticing is that the report received at 17:06:44 was the last report that contained alt, lat, lon, course, sog, and roc. After that there was one report at 17:06:44 without roc, and thereafter reports either contained alt, lat, lon or course, sog, roc, but never both. That is an interesting interpretation which perhaps lines up @Ed Baker’s voice analysis theory. He feels (per his analysis on Twitter if you are following that) that the second maintaining 350 call was the FO, suggesting perhaps the pilot left the cockpit. @TBill: I don’t follow Twitter but Ed Baker’s theory was discussed on the VI blog. If the autopilot disengaged the altitude may have varied a bit more than with autopilot engaged. That would be a plausible reason for the pilot wanting to reconfirm to ATC that he was still maintaining FL350. Jeff, what’s your take on all the Cambodian jungle and Google maps news stories? Does anybody else find it strange that primary contact was lost at 18:22, and at 18:25 the plane logged back in? As if somebody knew the contact was lost.. 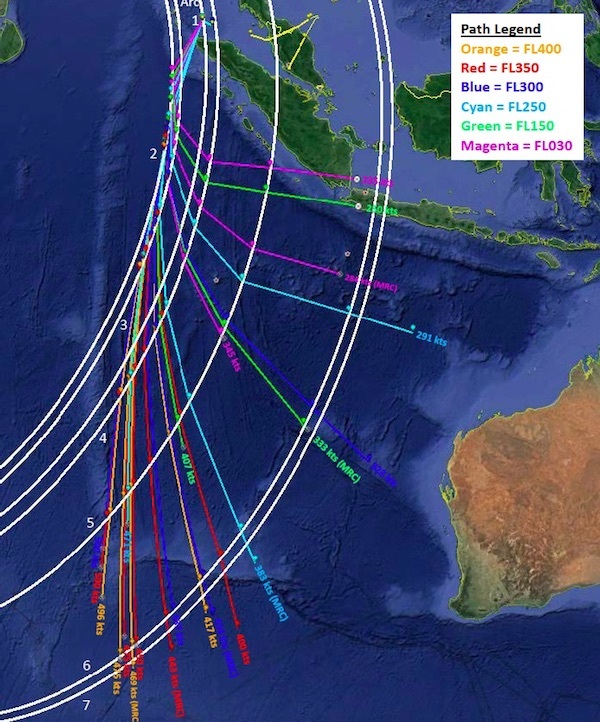 Assuming the whole thing was planned and there were people on the ground orchestrating the whole thing, maybe another plane with a custom built transmitter was sent in to take over MH370’s satellite link and send the fake log.. I wouldn’t be surprised if something like the HackOne RF SDR (Software defined radio) could be programmed to work with something like a laptop, and a software could be programmed to mimic the Inmarsat protocol.. all you’d need is 370’s credentials to log in.. All you’d need is an Inmarsat data expert.. who maybe had done some testing and knew the protocol, or just got their hands on some sample data from a 777. Another idea would be that they captured 370’s login signal, maybe on the ground, cracked the encryption and stole the login that way.. of course it’s not easy, but it’s possible.. I just find it very suspicious that as soon as it disappeared off radar it logged back in.. If it logged in while it was on radar, that would be a lot more credible.. but if you’re switching planes, it would be impossible to time that perfectly and re-send the signal in 1 hour exactly. You mean an Inmarsat expert as in the one that had an early heart attack days after the plane disappeared? i fear you’re correct and my days of taking even a portable radio on flights for airbourne dxing are over, and after what i’ve read here they probably should be. To my way of thinking, plane switching and hacking the Inmarsat data are too complicated and would increase the risk that the operation could fail. Much simpler to have Inmarsat provide faked data for an SIO crash. I suspect that the company is an undercover SIGINT unit and they provided the data to deliberately misdirect the search. @Chris, You’ve hit on what I consider the central puzzle in the whole mystery–how did the SDU come to reboot at 18:25? It’s a topic that’s been discussed at tremendous length in this forum, but to sum up, SDU’s generally don’t ever spontaneously reboot in flight, flight crew aren’t trained to reboot them, it’s virtually impossible to reboot them accidentally, and there’s no checklist that calls for them to be rebooted. 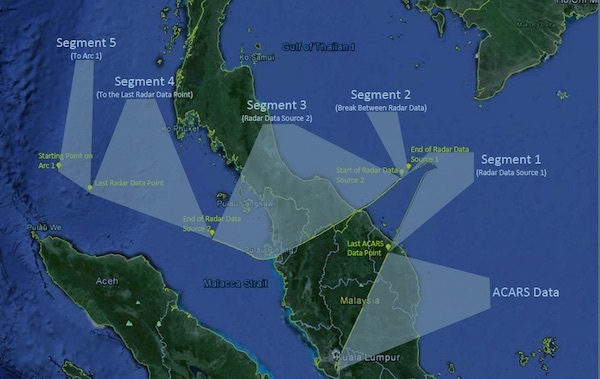 Basically, the six hours of Inmarsat data from which investigators derived the search area that they spent a quarter billion dollars scouring are all the result of an event that no one can explain. And yes, you can add on top of that the fact that the timing correlates quite precisely with the moment that the plane left primary radar coverage, which adds a whole ‘nother level of uncanniness. Search officials, and the “independent” investigators who support their pronouncements, have avoided grappling with this question. @Jeff Wise: A related question is what caused the SDU to become inoperative? @Gysbreght, Absolutely–off, on, no one’s been able to say how this could have happened. When I’ve raised the issue in the past, I get a shrug and “well, we don’t know, so let’s just move on.” What they don’t want to talk about is that the box you got all your data from looks an awful lot like it’s been tampered with. Which should be a matter of concern even before you realize a quarter billion dollars later that the plane isn’t in the area that the data said it should be. Chiming in late in the game here, so I’ll have to catch up on the details. But yes, I could not agree more — the plane could not have done anything else but fly north. I agree with your key reasoning (and form of reasoning), which is that it is a simple answer, because they simply flew north. As you wrote in NY mag article, about how everything suddenly fits when finally striking that right chord. For me, it was always about the validity of the Inmarsat data — which struck me as questionable for the sheer fact that no one (except you) questioned it. Anytime a problem is THAT unsolvable, logically speaking, it points to a fundamentally mistaken premise. So basically, it’s a binary thing and it either is, or it isn’t –i.e., MH370’s disappearance was the result of a massive orchestration, or it wasn’t. If it wasn’t, then the plane would have been found by now, by all the conventional means in which crashed planes are found. But if was, and the plan worked – then the plane would not be found, period. One cannot “half-way” pull off a plan like this, and with something as massive as a plane. But the sheer confounding / unknown nature of this fact (that such a thing could be pulled off) triggers most people’s brains to shut down. The psychological defense response, as you mentioned, of “well, we don’t know, so let’s just move on” – i.e., the human mind’s tendency to categorize what it doesn’t know, as untruth, rather than doing the less-natural thing that the brain resists: accepting the unknown, as a true fact of life. You keep saying that. Unfortunately, the data doesn’t say where it should be. The data is not sufficient for that, it leaves an area that is too large to be searched. The ‘high probability’ area is based on the assumption of an inactive pilot. The unsuccessful search has shown that assumption to be wrong. It is now almost certain that a person was active at the controls until the end of the flight. @Gysbreght, The only way that the data is consistent with the following southern scenario: Pilot turned the plane south, flew for six hours until fuel exhaustion, waited for first one engine and then the other to stop turning, waited a while longer, then pushed the nose down to enter a high-speed dive, then thought better of it, pulled out of dive and glided as far as he could either in the prior direction of flight or the reverse direction. So let ask you: if you feel the scenario described above is a reasonable one, what would be the corresponding explanation for the reboot of the SDU? Why do you give an unwarranted twist to the scenario that makes it unreasonable? My version is that pushing the nose down was necessary to recover from a stalled condition. In that case pulling out of the dive would be perfectly reasonable. As to your question about the reboot of the SDU, it must be seen in relation to the explanation of the loss of the SDU. The most plausible explanation is that power was removed from the electrical bus that feeds the SDU, and that that power was subsequently restored. My explanation for that is that the person(s) who diverted the flight simply cut off all generated power, leaving only the batteries for instruments and primary flight control. That would explain the now accepted fact that the autopilot was off after the diversion until the plane was out of radar range, since the autopilot is not available without generated power. At about 18:24Z generated power was restored to make the autopilot available again. The person(s) at the controls at the end of the flight was/were not necessarily the person(s) responsible for the diversion. @Gysbreght, An airplane can’t stall without input in the first place. So your scenario would call for a pilot first to stall the plan, then recover it with a dramatic maneuver. Not only that, but the timing would have to have been extremely fortuitous for the manuever to be taking place at exactly the moment the final pings were generated. As for the SDU power-off, I guess you’re talking about pulling circuit breakers to isolate all the electrical buses? This seems unlikely because a) it is crazy, I’ve never heard anyone ever doing anything like this b) the fact that the plane flew straight and fast between navigation waypoints suggests that its avionics were working. That’s debatable. A 777 with autopilot off is controlled by the Primary Flightcontrol Computers according to control laws that modify the natural flight characteristics. Some of the end-of-flight simulations conducted by Boeing in 2016 exhibit roll oscillations in phase with the longitudinal phugoid oscillations that I can only explain by stalling characteristics. Leaving that aside, my scenario assumes a person making control inputs that result in the airplane stalling. The maneuver you consider ‘dramatic’ may appear to be somewhat ham-fisted, which indicates that the person may not have been familiar with the airplane’s flight characteristics, nor with the stall recovery procedure. That’s not particularly ‘fortuitous’, considering that both events are triggered by the failure of the second engine. Either that, or by using the electrical system controls on the cockpit overhead panel. Have you ever heard of anyone making an airplane disappear like this MH370? The radar data show that the airplane did not fly straight and that it flew at altitudes and speeds that are not compatible flight controlled by the autopilot. The batteries would support the primary flight display and navigation display for some time. Perhaps electrical power was selectively and progressively partially restored before finally being restored to the Left Main AC bus that powers the SDU.